To create a healthy environment, every plastic should be recycled to avoid cumulation. We can't just incinerate because they will produce carbon emission, as well as putting them in the landfill which becomes a carbon sink, plus they do not not decompose in the sea. Most of plastic compositions are unnatural, incorrect usage and disposal of plastics can lead to cancer, skin irritation, and other diseases. 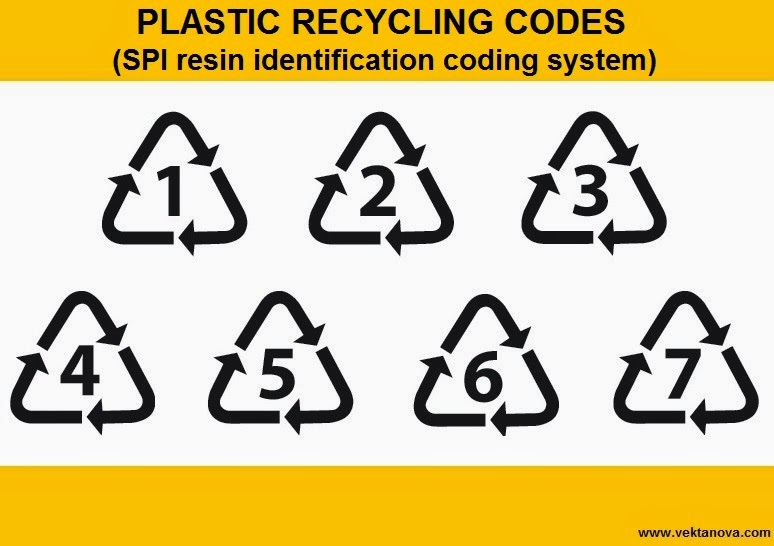 To defeat this great challenge, Society of the Plastics Industry built a simple innovation in 1988, by putting symbol codes to ease and assist people recycling plastics. And nowadays that method has been used by most of plastic manufacturers. These are the symbols that you can find on most plastics. Polyethylene terephthalate is the most common thermoplastic polymer, and usually is used in fibres for clothing. Mostly as the composition on fibres for clothing, containers for drinks (regular plastic bottles) and foods. It is also used on sailcloth and parachutes. This kind of plastic is not safe to be placed under direct sunlight. High-density polyethylene or polyethylene high-density is polyethylene thermoplastic made from mostly petroleum. This kind of plastic has more strength and can stand for heat for short period. This plastic is used in plastic bottles, bottle caps, plastic furnitures, plastic bags, stone papers, fireworks, hula hoops, hard hats (construction helmets). Although it can stand for heat, this plastic is not safe under direct sun for long duration. Polyvinyl chloride has strength and flexibility. It's used on card, sewerage pipes, door and window frames, wire insulators. It's also used as composition of medical devices and clothes (usually to imitate leather). PVC is best known as a replacement of rubber because it's cheaper. Low-density polyethylene is a thermoplastic made from the monomer ethylene. This plastic is used on many applications. Mostly is used on any containers, computer parts, juice or milk cartons, plastic wraps, and phone cases. Polypropylene or known as polypropene, is also a thermoplastic polymer. It's used widely on furnitures like chairs and tables, mats, carpets, ropes, clothes, and even body accessories. PP is strong, colour fast, and light. Polystyrene is a synthetic aromatic polymer made from the monomer styrene. Used on many applications, for instance, carry-out drink and food containers from fast food restaurants, video cassettes / tapes, toys, Styrofoam. Some containers from PS are heatproof (but it's recommended not to use those on heat). U.S. Food and Drug Administration and the European Commission/European Food Safety Authority claims it is safe to use PS as food or drink packages. PS is highly flammable. Plastics with this symbol are categorised as "Other", usually can be found on applications that made from unusual plastics like polycarbonate, polyamide, polyacrylonitrile, and styrene acrylonitrile. The safety level of this plastic may vary, depending on the each product description. Most of those plastics are hard or even unable to be recycled by common recycling systems. Polycarbonate plastic is also used as baby plastic bottles and other containers that is safe to be reused. Acrylonitrile butadiene styrene (ABS) is a common thermoplastic polymer used on cell phones, computer keyboards, pianos, clarinets, carry-out drink and food container caps, toys (e.g. Lego), and pipes. ABS is strong, light, and mould-injectable. By knowing the codes, now you know which ones are safe, and what are those recycled to. And you are also contributing to safe the Earth. No response yet to "Plastic Usage and Recycling Codes You Should Know"